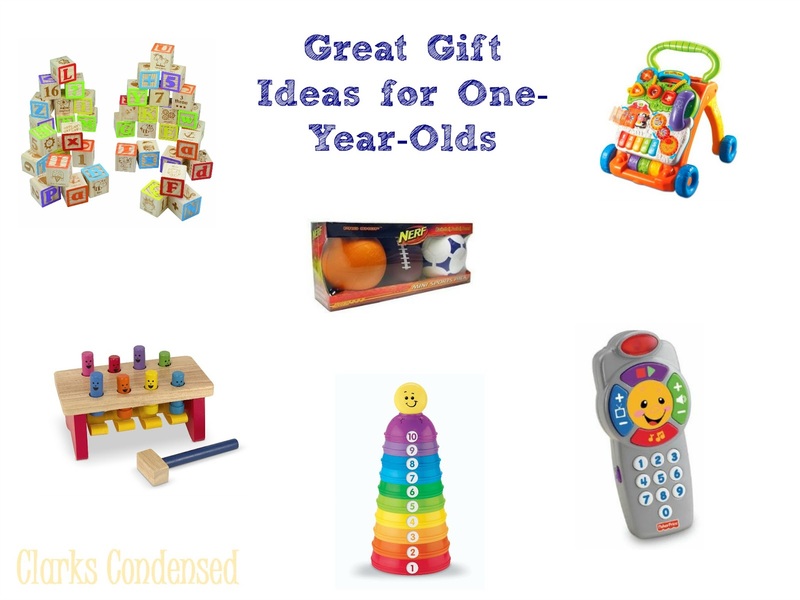 In continuation of Jack’s birthday week, I decided to share some of my favorite toys for kids around the age of one on today’s Friday Favorites post. I looked at lots of toys over the past few months, and have a good idea for what’s out there. And after having purchased some of them and watched Jack play with them — I know which ones he likes the most! This list won’t have a lot of super expensive or elaborate toys. I really think that babies and young toddlers refer simple rather than complex. And, to be honest, Jack loves playing with random household items like straws. But if you’re looking for a reasonably priced gift for a one-year-old, you’ve come to the right place! I searched high and low for the blocks I wanted to get Jack. I didn’t feel like he was old enough quite yet for blocks like Lincoln Logs, so I decided to search from some ABC blocks that would be easy for Jack to stack with. Who knew it would be so hard to find a set of good quality, yet somewhat inexpensive, alphabet blocks? I got these on sale, so it was actually about 10 dollars less than the sale price is now, but I LOVE them. They are the perfect size — not small enough that Jack can put them in his mouth, and not big enough that his little hands can’t pick them up. They are made out of great quality food, the paint doesn’t seem like it’s going to chip off, and they have lots of fun colors, shapes, and pictures on them. One of the main complaints I kept seeing about different blocks were that they were too small and the pain chipped off really easily. So I was really excited about getting. Right now, they are 29.99, but keep an eye out, because I’m sure they will go on sale again. Forrest’s parents got this for Jack for Christmas, and needless to say, it is definitely a huge hit. Not only does Jack love it, but just about any kid that comes in contact with it! I have memories of a few nieces and nephews of mine (some that are closer to the age of ten than one…) running around and playing with this at Christmas. This has been such a fun walker to have for Jack. It has lots of music and sounds, and I love how bright it is. Jack loves the phone, the shapes he can take on and off, as well as the little door next to the cow that opens. He also looks like he feels so proud of himself when he moves it across the room. I like that it can be used as a walker, or the front can be detached and put on the ground for smaller babies. If I had to pick one thing that Jack loves to play with the most, it is any kind of ball. He loves rolling them across the ground, and has even started throwing them too. We have a full-sized basketball, football, and soccer ball that Jack loves, as well as some other smaller balls. In fact, besides mama, ball is his favorite word. These nerf balls are small, and soft, and perfect for little hands. My sister, Kristalyn, sent this to Jack for his birthday, and I was so excited! I had seen it a few times when I was perusing Amazon awhile back, and often contemplated getting it. Jack really likes it — on his birthday, he was so mad when I took it away for him to open another present. It’s great for helping with fine motor skills. You can stack the cups up high, or put them together to make balls. We have really liked putting the smiley ball inside of two of the cups and then rolling them around. It’s inexpensive, at about $10, but it’s definitely one that small children will love. It also seems really durable . Jack has pretty much been obsessed with remotes since he was about six months old. And because we don’t really like having the show we are watching to magically turn off, or risk Jack taking off the back and eating the batteries, this was a wise choice. He really thinks it’s a remote, and it is definitely much more fun than a regular remote because it sings and plays games! The songs are rather catchy as well — I find myself humming them to myself throughout the day. Finally, I highly recommend getting storybooks for your one-year-old. I don’t have any particular suggestions, but I’ve been told time and time again how important it is to read to your child. We have accumulated a lot of board books over the past year, and I love how Jack goes and finds them and “reads” them. We especially like ones that are smaller, because he can turn the pages without much struggle.